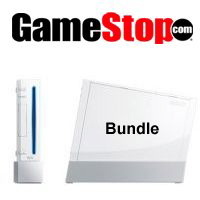 We're still days away from the official launch date, but the folks at GameStop are showing off their online Wii bundle for the lucky few who'll get to snag one come the 19th. The $694-dollar package will get you 6 games (Zelda: Twilight Princess, Trauma Center, Red Steel, Marvel Ultimate Alliance, etc), a 1GB SD Wii memory card, a second Wii controller, the console, and Wii Sports. It's not a bad deal in the long run, that is, if you pre-ordered on time.